When during Enroot seminar Mrs. Sandra asked ‘who wants to go to a conference on “Girls to Engineering Day” I raised my hand even when I did not know what’s engineering really means. I just raised my hand because I knew it’s a chance to discover something new for myself. I knew that engineers build and count. This was the only information I knew about engineering. After this trip I know more than I knew before. I learned that engineers are problem solvers. When they work on something, they predict effects. This is an important feature of an engineer. Also I’m glad that members of this event answered the main and important question: what makes an engineer? Curiosity, creativity, teamwork, opportunities, helping others. I understand that I do not have all these features, but I’ll work on it because I need these features even if I’m not an engineer. I need them as a person who wants to improve herself. I think all of us need these features. Going to this conference was interesting. I do not regret that I participated in this event. We practiced being an engineer. We built a school on a map. We selected relevant materials and thought about price and benefit. That moment I understood how hard is being an engineer because you must to think about many things. If you change one thing, you change other thing as well or sometimes everything. My favorite activity was making a beach. We had to protect a house from big weaves. We thought how to make the house safer. We had some options and we chose the best one. At the end we decorated the house to make it funnier. But I was sad when we destructed the beach and the house. I was sad no long because I won a prize! The prize was a book. In my opinion I won the best thing because a book is the most helpful thing in my life. It gives me knowledge and helps me. I was glad that I went there. I learnt a lot of new things. Thank You Mrs. Sandra and Girls to Engineering! Enroot is celebrating Black History Month! We’ve decided to do something different this year. Everyday of February we will post some facts about places that Black people call home and some stories of Black unsung heroes. These places include Africa and the Caribbean, but also Latin America, where many identify as Black. We are hanging these features on a wall where our staff and students can learn new things every day! This wall will be at our Enroot office and in our offices at Cambridge Rindge and Latin School and at Somerville High School. It includes people like Barbara C. Jordan - she was the first African American elected to the Texas Senate after Reconstruction. Frederick Douglass escaped slavery and became a national leader of abolitionists. Bessie Coleman was the first licensed African American female pilot. We also learned that more than a million African slaves were brought to Cuba as part of the Atlantic Slave Trade. It is said that 65% of the Cuban population are descendants of slaves. Additionally, Ethiopia was the only country in Africa which never colonized! We are so excited to learn and share more throughout this month in honor of the people and places of Black history. On January 17th, we had a special seminar and we went on a field trip to Fidelity. Fidelity is a multinational financial services corporation based in Boston, Massachusetts. It’s one of the largest asset managers, it controls around $2.5 trillion. We were exploring and admiring the art around the building, led by an employee who worked at Fidelity for 12 years. There was an art which really surprised me, it was called “Eumorph” made by August Ventimiglia. He made it with chalk tape. There was another one which was fascinating. It was made by Thor and Jennifer Bueno called “silver series.” It was made of different shapes of silver droplets and contained a chemical element called Mercury. We also had some delicious snacks that they offered us. We had an panel where we talked to 3 employees and they were sharing their past with us. They told us how long it took for them in order to be what they are today. They also talked about a rotational program where you can work with different people in different departments, which will help us discover what we want to continue doing. We also talked to different employees who had different majors in college. I personally think it was a great experience talking to different people and know their opinion about how to succeed. I also added them in linkedin in order to stay connected with them, so I can keep talking to them and in future they can help get a job or internship. 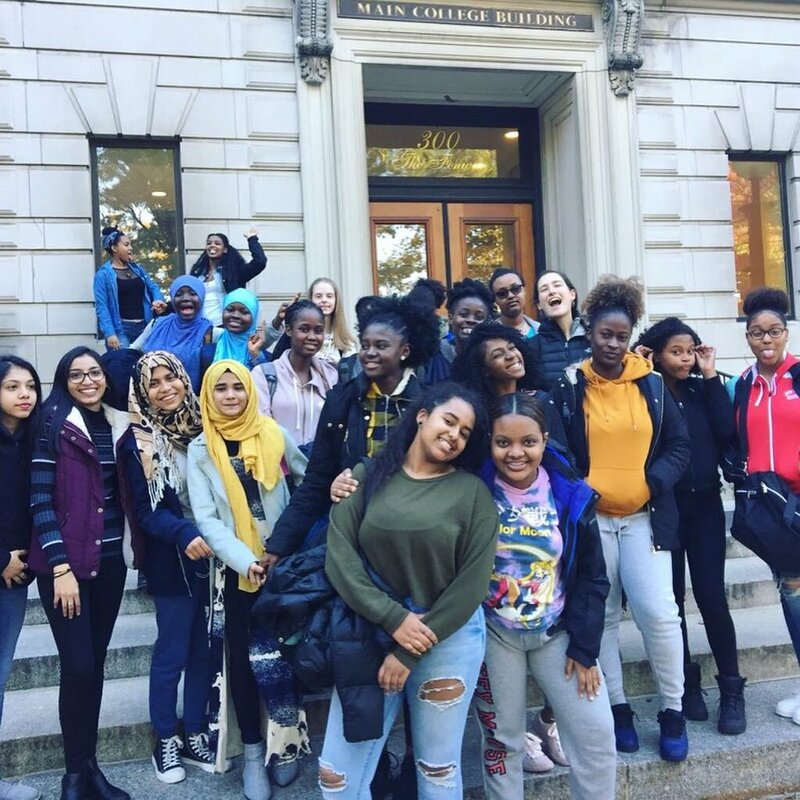 On October 31st, the Enroot female students made a trip to Simmons University located in the Boston area. Simmons University is a women-focused university. At the University, students were given a presentation about the requirements to apply to the university. Students were also guided about the financial aid at Simmons University. Students were told about the scholarships that Simmons has to offer. Finally, students were educated about the programs Simmons offers to those who are undergrad. Something to take into consideration from the tour to Simmons University is the Kotzen Scholarship that Simmons offers to those who have a GPA of 3.49 and SAT scores of 1300 or above. The Kotzen Scholarship covers the cost for tuition, study abroad, and dorms. Students were informed that they can commute from home while being a student at the Simmons University. Enroot always takes students to tour like this to different universities and colleges. It is really helpful for students who are seniors and also the ones who are juniors, sophomores, and freshmen because the tour can help students figure out which college is the best fit for them. On October 15th , the first Enroot seminar of the year started with all the excitement and joy. I saw happiness in people and Enroot staff to just be in the seminar. We met for the first time with students, friends and staff and talked about our summer, how we’ve been. We had seminar for the whole week. On the first day, we introduced each other and welcomed the new Georgia which is Katie. Katie makes sure mentees meet their mentor and same for tutoring. We played games like Would You Rather, The Great Wind Blows and the blanket game, which was a great activity for us to learn each other’s names. We also got in groups of 4 and made posters about our culture. We divided a poster into 4 and we shared our culture. Anything which represents our culture, we drew that on the poster. One of the fun activities was mirror drawing. It was an excellent way to enhance your writing and listening skills. We are in the Leadership Program, which also gives us an internship along with tutoring, mentoring and weekly seminar. We talked about internships, how to dress professionally and how to go for an interview. The Cambridge Program Director Sandra Canas and staff member Debbie acted out being a bad and good intern. We also took an survey about how are we doing in this program. I am glad Enroot started again, I know I am gonna enjoy a lot and I look forward to it. My name is Oumaima. I’m in 11 grade. I’m from Morocco. For Enroot we have 3 parts, Seminar, mentor and tutor, But I like the seminar because we visit a lot of places like last Thursday, we went to the City Hall to visit mayor, it was very good because I have never seen the Mayor of my country. I learn a lot of things from Enroot with my tutor, my mentor and seminar. In seminar we play games, we talk about colleges. For my tutor, she helped me with my homework. For seminar. We hang out together sometimes. Something that I like to learn more is practice more English and get my grades up. I like this program because they helped me a lot. I’m a 16 year old, I am a junior in high school and I want to major in Pre-med after high school. After 4 years of college, I want to work in a hospital as a registered nurse and go to school to get my Bachelor's degree and then to medical school to become a doctor. I moved to United States 4 and half years ago with my dad, mom and my brother. My first day of school in united states was confusing because even though I learned English in India, I was not very good at it. I wanted to make new friends but all I was thinking on my way there was how am I going to talk to others? I was scared that I didn’t know anyone at the school but I was also excited that I was going to a new school. I was an ESL [English as a Second Language] student for 3 years, over those 3 years I’ve learned a lot. I’ve learned English, I’ve learned how to make new friends, I’ve learned that no matter how hard something is do not give up until you achieve it. In those 3 years I was accepted into City Links Program, now Enroot. I took the opportunity to be in the program. Then I joined Enroot again my junior year and I have an internship in Enroot, I work with amazing staff. I am grateful to be a student. I was switched to a mainstreamed English class my sophomore year where I was scared at first, I was in a class full of people who spoke English fluently. Everything that I learned in ESL class made it so much easier for me to understand things in the mainstreamed English class. Now I am in 11th grade, can speak English well, and I am more confident in myself. Enroot Somerville students meeting with their mentors. My name is Sarah. I am in the 11th grade, I am from Brazil. I had an interview at Somerville Community Schools Program organization, with Jennie. Before the interview I felt nervous and anxious, but in the middle the conversation I got more comfortable, and the interview went well. In the room had more for students with me and 2 supervisors, we answer the questions together and I felt more easy, and another reason for my feeling comfortable was we practiced the questions in the Enroot program before the interview. They asked me what I want to improve and my answer was I want to improve and learn more about work with children, do some different activities, meet more different people, because my experience was with my relatives, like my cousins, siblings, and I want to improve my English. We had a great experience with our intern and we’re happy we were able to provide a learning environment for an Enroot student and look forward to the possibility of hosting in the future! I am in 9th grade at Somerville High School, and I am from Brazil. I go to Somerville City Hall for my internship after school. I create tables on Excel, and enter required data. I organize files and folders in the office. I also highlight required data that I am asked for. I learned how to access and work with excel. I have learned how to keep myself organized. I interact with people at work, and I feel confident to talk to new people now. I would like to learn what is the data they give me to work with. Thanks Enroot for the opportunity to intern at City Hall. Thank you to our internship partners! My name is Manuel, I am a freshman in Somerville High School. I originated from the Dominican Republic, a country southeast of Florida. My Mentor and I work on assignments, play games and go out to restaurants. We went to Redbones Barbecue in Davis Sq. The Food and design of the restaurant was Southern American style. We ordered Beignets, long and skinny french fries, and pork sandwich. The food was marvelous and the service too!!!!! I like it went my mentor helps me with my daily assignments but enjoy it more when we do fun stuff that does not include HOMEWORK. It was great to spend time with my mentor in a different way. We got to know each other as friends instead of student and mentor and we had a fun time together. I never had this kind of food before. Beignets - are fried dough with powdered sugar and they were FANTASTIC. I want to learn about the food, culture and were they first originated. I like to learn more about Beignets and other food like Indian, Chinese, Russian, British, French, and Italian. It’s good to spent time with someone else that you are having a relationship. Hi, my name is Kela, and I’m in 11th grade at Somerville High School. I’m originally from Port-au-Prince in Haiti. For my 18th birthday in February, my mentor Afton and my tutor Caitlin celebrated with me and a friend by going out to eat together. We went to Redbones in Davis Square and had a lot of fun. Afton chose the place to eat because I didn’t know where to go, but I really liked the BBQ sandwich. It was the best birthday ever! When I go out with them, we have a lot of fun together. I like my mentor and tutor because they are awesome and really help when I don’t know what to do. Afton has really helped me write my resume to help apply for jobs and college. When I was struggling with my science fair project and I didn’t know what to write about or where to start, Caitlin gave me a brilliant idea what to write about, and she helped me write the project. Enroot is really a great program because I’m able to have a tutor, and talk to someone about college.